Egypt’s President Mohammed Morsi has warned in a televised address that “enemies” of the country could plunge an increasingly divided country into chaos. His speech came days ahead of planned demonstrations urging him to step down and hold new elections. Although he did admit he had made errors in his first year as the first civilian democratically elected to the presidency, Morsi blamed the increased political polarity for damaging the democratic course the nation has taken since ousting President Hosni Mubarak in February 2011. “Political polarization and conflict has reached a stage that threatens our nascent democratic experience and threatens to put the whole nation in a state of paralysis and chaos,” he told an audience of officials and Islamist supporters in a speech that was broadcast live on television. “The enemies of Egypt have not spared effort in trying to sabotage the democratic experience,” he added. Hoping to appease his detractors, Morsi promised to establish a committee of prominent public figures, including Muslim and Christian clerics, to promote “national reconciliation”. Hours before Morsi’s speech, clashes in Daqahliya governorate north of Cairo, killed two and injured over 230 people after Morsi supporters staged a march calling for backing the legitimacy of the Islamist president. Thousands of Muslim Brotherhood and Morsi supporters have been holding rallies in support of the president and have vowed to protest against his detractors in nationwide demonstrations planned for Friday. They say that he has been unfairly targeted by critics with foreign agenda. Ikhanweb, the official English-language website of the Muslim Brotherhood, says that anti-Morsi protesters have engaged in “terror acts” against the president’s supporters. Meanwhile, hundreds of anti-Morsi protesters flocked to Tahrir Square in downtown Cairo, the center of the massive demonstrations that led to Mubarak’s fall two years ago, in preparation for sit- ins. Reaction to the speech was quick. Those gathered in Tahrir Square say the president brought nothing new to the discourse on Egypt’s future while others believe the speech was dismissive of criticism and overly defensive. “Morsi’s speech belittles him far more than the puny foes he chose to name,” Bahaaeldin says. He also criticized Morsi’s potential use of military law to silence future critics of the “commander in chief”. Omar Kamel, a video producer, musician and member of a local group opposed to military trials for civilians, sees several inconsistencies in Morsi’s speech, which he called “tedious blather”. “Morsi claimed to seek national re-conciliation, while trying to blame protesters for his failures and accusing the opposition of being conspirators out to destroy Egypt. Morsi said serious reforms are needed, but offered none,” Kamel told The BRICS Post. Kamel says that Morsi tried to take credit for routine annual salary increases, and lied about increasing healthcare spending in the budget. “He claimed to be against foreign debt, when he has all but pawned Egypt for loans. 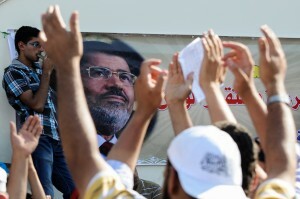 Morsi, in brief, was desperate, misguided, and inarticulate,” Kamel said. In the meantime, a number of business and institutions have said they will be closed between Friday and Sunday, fearing violence during the pro-government and anti-government protests planned for June 28 and 30, respectively.